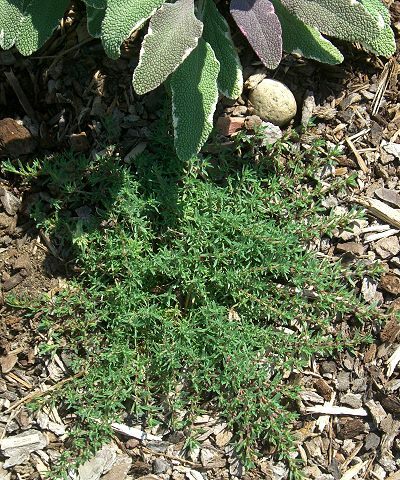 Heretus Thyme is one of our most unusual ground cover thymes with its long, narrow, gray-green leaves that give it an almost lacy appearance. But, don't let its appearance fool you. This is one tough plant and is worthy of any garden. The Heretus Thyme on the left peeking out from under a Tricolor Sage measures about six inches in diameter and was planted only three months before this picture was taken. At maturity it can easily reach 10 to 12 inches in diameter. 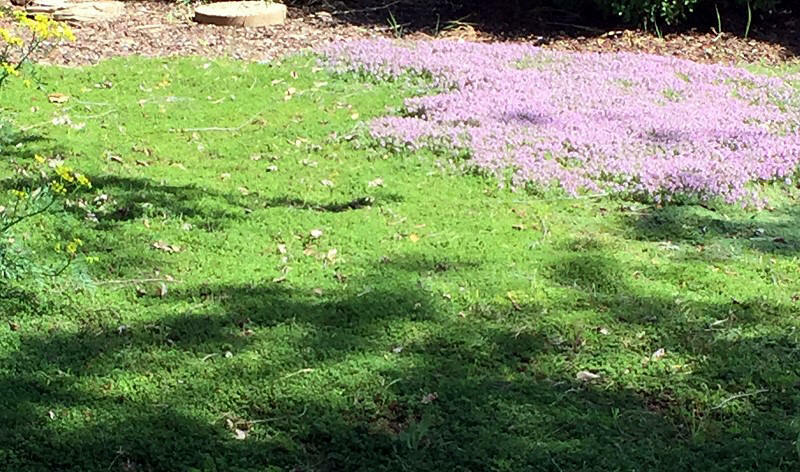 Even more impressive than the way Heretus Thyme grows and covers the ground is the incredible display of lilac flowers it produces in early spring. Below a Heretus Thyme bud gets ready to burst forth with its gorgeous color. 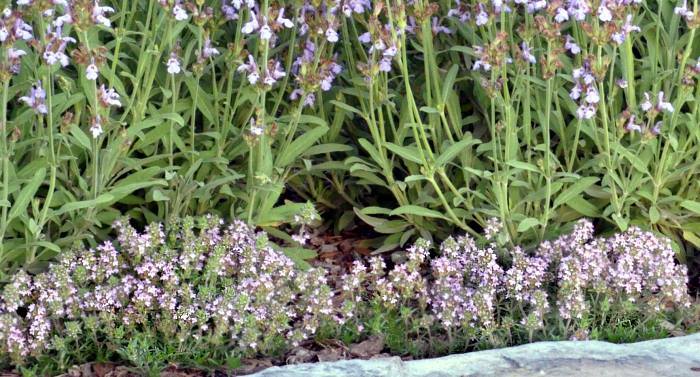 Above, newly planted Heretus Thyme creeps and blooms along a slate stone under a Dwarf Garden Sage. 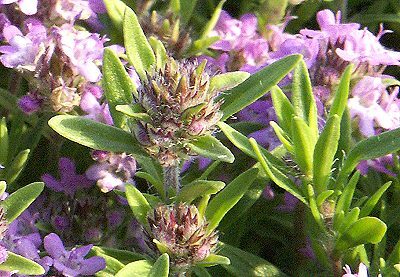 The bright bluish-purple of the garden sage and the lilac of the Heretus Thyme seem an unlikely combination, but the effect is stunning. The hard working Heretus Thyme blooms for weeks after the sage is finished. The blooms can reach two to three inches in height. After bloom, the flowers fall off leaving slender stems which can be sheared off or left to fall off. Once the flowers are gone, the thyme becomes low and flat to the ground again. This is when it begins to creep once more. The first photo below shows the same plot of Heretus Thyme one year later. It is the thyme in the background. The blooming thyme in the foreground is one year old Caraway Thyme, a much faster grower thyme. The flatter, non-blooming green thyme in between the two is Elfin Thyme. The second photo below was taken about four years later. The Dwarf Garden Sage and flagstone were removed to let the thyme cover more ground. The Caraway Thyme is still there but can't be seen from this angle. However, the Eflin Thyme was completely taken over by Pink Lemonade Thyme which is the rest of the thyme in the picture. It will not bloom until late summer. Heretus Thyme seems to hold its own but Pink Lemonade Thyme is a very aggressive ground cover which, may in time, take over the rest of the Heretus. Because Heretus Thyme is a little slower growing than some of the other ground cover thymes, it can be used either to cover small patches of open ground or to fill in between stepping stones. 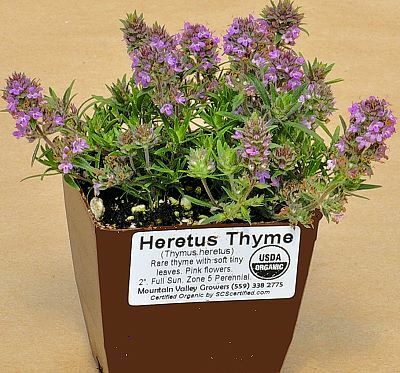 Heretus Thyme is sometimes included in our Flagstone Filler Assortment. This plant is often available in plug trays. These trays hold 128 of all the same plant. They are a great low cost way to fill a lot of space. Each cell is 3/4 of inch by an inch. Check here to see if Heretus Thyme Plug Trays are available.